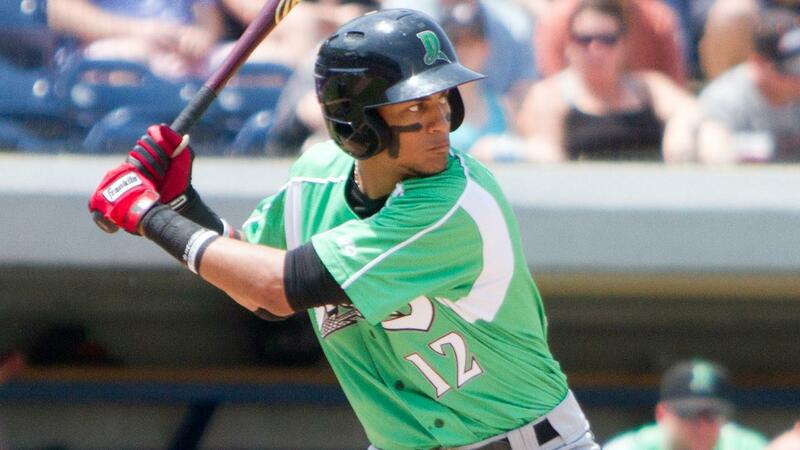 Dayton Dragons outfielder Jose Siri homered and stole a base Sunday, putting him in a pair of elite Midwest League clubs. Siri entered the game with 19 homers and 39 stolen bases, so when he went deep in his first at-bat, the Cincinnati Reds prospect became only the fifth Midwest League player to hit 20 homers and steal 30 bases in a single season. But the 20-30 club wasn’t enough for Siri. He walked in his second at-bat, and eventually swiped third for his 40th stolen base. That put Siri in even-more elite company as only the third Midwest Leaguer to hit 20 homers and steal 40 bases in a single season. The other two players in the Midwest League’s 20-40 club achieved the rare feat in 1982 — Tom Romano (26 HR, 66 SB) did it for the Madison Muskies, and Chuckie Canady (20 HR, 51 SB) did it for the Burlington Rangers. The other members of the 20-30 club are Greg Vaughn (33 HR and 36 SB for the 1987 Beloit Brewers) and Corey Patterson (20 HR and 33 SB for the 1999 Lansing Lugnuts). The 20-30 club almost got two new members this year. San Diego Padres prospect Fernando Tatis Jr. hit 21 homers and stole 29 bases for the Fort Wayne TinCaps this season, but was promoted to Double-A San Antonio before Sunday’s game. Siri is batting .296 in 114 games with the Dragons this season. His Midwest League-record hitting streak of 39 consecutive games ended earlier this month. Last week he was named to the MWL Postseason All-Star Team. Also on Sunday, Lugnuts outfielder Nick Sinay was hit by a pitch for the 36th time this season, tying the Midwest League record set by Clinton LumberKings third baseman Jonathan Greene in 2008. Lugnuts players have been hit by a pitch 104 times this season, nine shy of the MWL record for a team in a single season. The 2001 Quad City River Bandits were hit by 113 pitches in 137 games. That QC team included future American League MVP and National League batting champion Justin Morneau (3 HBP in 64 games) and current Cedar Rapids Kernels manager Tommy Watkins (2 HBP in 73 games). Outfielder Kevin West, who topped out at Triple-A, led the team with 28 HBP in 126 games. The Toronto Blue Jays traded Lugnuts RHP Osman Gutierrez to the Miami Marlins on Saturday for MLB veteran pitcher Tom Koehler. Gutierrez went 4-11 with a 7.85 ERA, 71 strikeouts and 52 walks in 78 innings (18 starts) for Lansing this season. Koehler went 1-5 with a 7.92 ERA, 44 strikeouts and 29 walks in 55.2 innings (12 starts) for the Marlins this season, and had been pitching for the team’s Triple-A club since being demoted in late July. This entry was posted in Beloit Snappers, Burlington Bees, Cedar Rapids Kernels, Clinton LumberKings, Dayton Dragons, Fort Wayne TinCaps, Lansing Lugnuts, Madison Muskies, Midwest League, Quad Cities River Bandits, San Antonio Missions, Texas League. Bookmark the permalink.